The photography part is definitely my absolute favourite part in the progress of creating new content for my blog. Even though it can get quite frustrating sometimes I also find it soo satisfying when the outcome is just as I imagined it to look! Of course editing the pictures plays a huge part in the whole process and it actually took me quite a while to find a program/app that works well for me and offers all the tool that I need to edit my pictures in the style I want. The problem in this whole thing was that most bloggers that I follow use Lightroom to edit their pictures and as I was not willing to pay for it, I had to keep searching for a similar one, and I think I have finally found a website that works just perfectly for me! I´ve tried myself through a whole lot of different free editing programs and the one that I always went back to and been using since easily a year or more now is BeFunky. I´ve always found it hard to control how much of an effect you want to have on your pictures or it was really hard to keep your pictures looking natural and not overly done. Like for example you want to make your pictures brighter, and some programs just add that very weird looking grey film over it, and stuff like that was soo frustrating to me, haha. With BeFunky I don´t have any of these problems. It took me a while to find a good selection of tools to make my pictures look the way they do now and I also think that I´ve finally mastered to figure out how much I need of each tool to make my pictures look how I like (actually really adore) them! Color - I´ve only recently discovered this tool and it literally has changed my picture game to the better - like I swear it´s my life saver sometimes. As you can tell by its name, this tool will help you with the colours of your photos. I like to up Saturation to about 7. Saturation will make the colours in your picture more intensive which is just amazing if I have to brighten my pictures up a lot, that way I can kinda even it out a bit. Then I also really like to use Temperature. Before I used it to make my photos look basically white but now I like to use it to add a bit of warmth to it. I vary between 1-3 which works really well for my style. Exposure - And lastly I add the finishing touches by turning up the Brightness to 10-20 depending on the brightness of my picture. Then add Contrast to 15, not sure of the affect of it but I guess it also makes my pictures a bit more intense. If the brightness has made my pictures not bright enough yet I add a bit of the Highlights - but only really about up to 5 as with this one you can really make your pictures totally unnatural. Now we come to what I use to edit my Instagram picture. I had this app on my phone for ages before actually getting into it and understanding how to use it. Inthefrow´s pictures got me motivated and excited to use this app more frequently and properly - cause let´s be her instagram feed is absolute goals. I love this app to bits as it´s just super easy, has sooooo many tools and options that you can play around with. I recently found myself just uploading random pictures to it and playing around with different editing styles and the results are literally out of this world! Here you can see what I mean, just look how intense the colours got and how sharp and good the quality is. 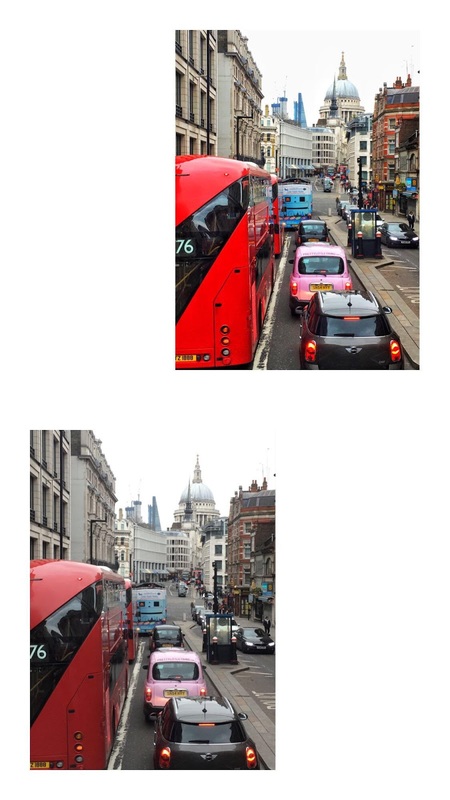 Just for your information, I took this picture with my phone through a quite dirty window of one of these sightseeing buses. I don´t think you would expect that after I´m done with editing. Tune - It´s the one on the upper left corner on the tool page and there you can adjust things like brightness, contrast, saturation, ambiance, temperature, etc.. How much I use of each of these things always varies on the quality of the picture. I always try around and see how I like it the most. Spot Repair - I love this tool! If you have a blemish or you didn´t notice your photo background was dirty you can just paint over it with this tool and it will dissapear perfectly. Again it´s something you have to play around with to get the hang of it, but once you do, you´ll love it! 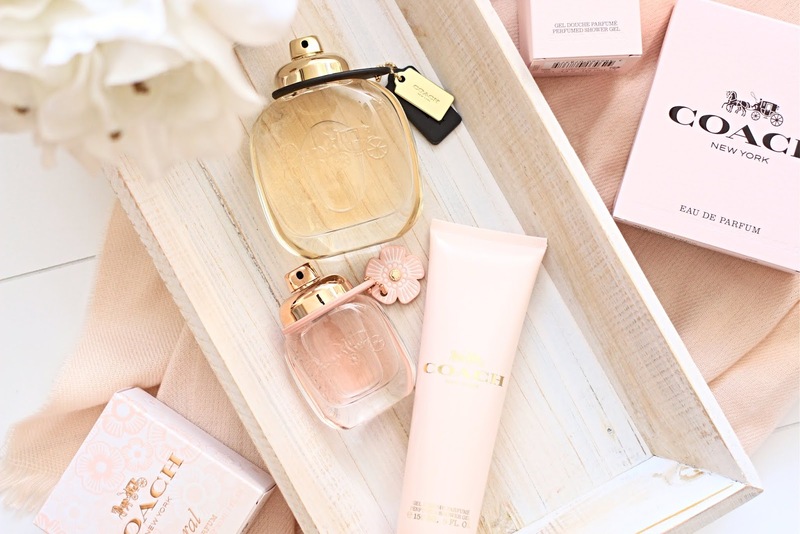 Who doesn´t love a heavenly smelling, unique fragrance? I definitely do and am always on the hunt for a new one I can keep sniffing, recommend to my friends and family and overall just make it my very own unique scent. You might know this brand more for their bags, or just generally their leather ware, but some time ago they launched fragrances - I can tell you one thing about them already, they are FAB! The bottles resemble the typical design of their products, you get a really simple yet kinda classy and luxurious looking bottle - according to the motto less is more. 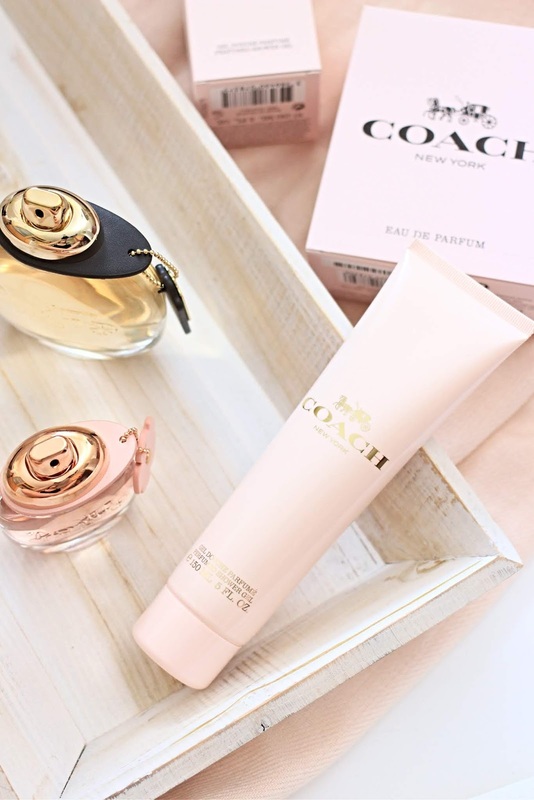 Formed into the glass is the Coach Logo, which I find looks really cool as you can see right away from which brand this perfume is, without it being too obvious and over the top. Another thing that I found really cool, is that the sprayer looks exactly the same as the buckles of their bag, I really love how thoughtful and detailed even the bottles were designed. "Inspired by the spontaneous energy and downtown style of New York City"
Their first fragrance was inspired by NYC, where Coach was founded, and so is also kinda something really special for them, I believe. With the ingredients of this scent they kinda tried to hold onto their main product range - leather. So for the base scent they choose a suede musk, don´t think that this fragrance smells a lot like that though, it does have a really light leathery scent to it, but with the Turkish Rose and Raspberry that were also added, it has a really gorgeous scent - a bit fruity, a bit rosy and a bit of leather makes a really nice mixture. I find it really comfortable to wear, as it´s not a heavy scent that will be the only thing you smell for the whole day, but it´s more like something that fades away a bit but people around you will easily be able to smell it when you move around or pass by. This fragrance is the first one I got compliments for, and jesus did I get a lot of compliments. I first had the 30ml bottle, before I was kindly gifted the 90ml bottle, so I gave the smaller one to my mum and she wears it daily! Same as my sister who even already purchased this perfume already. It´s definitely a big hit in our family! All in one, this fragrance is a timeless scent, that you can either wear in the summer or in the winter, it just fits perfectly and gives you a really unique and lovely scent. Just recently they brought out the spring/summer edition fragrance and oh my god I love it! I´m generally someone who likes sweet, feminine fragrances more than anything, and so this one was something I was really excited about as I already loved their classic fragrance so much. I was absolutely not dissapointed! 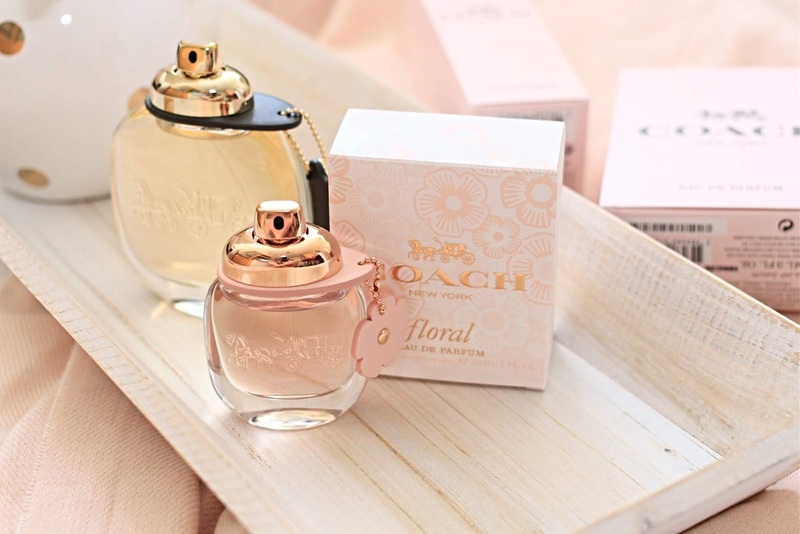 This perfume is inspired by Coach´s signature Tea Rose collection (find here), starting from the packaging and the bottle tag with those cute little flowers on, which you can find on every single item of the said collection, to the absolute gorgeous flowery scent of this fragrance. I find this is soo comfortable to wear, cause you know those perfumes, where you kinda always think it might smell too strong and just not nice to smell all day round - well this is definitely a scent that is easy to wear and actually stays on during the whole day! Now that I´ve mentioned about a hundred times how good it smells, I´ll tell you what makes the perfume smells so good. As a base they choose crystal musk, and on top sambac jasmine and pineapple sorbet. I find it has a quite musky scent, yet is kinda sweet and fresh smelling and so is all in one a very chic and elegant feminine perfume. I´ll surely wear it throughout the whole summer, as it just adds that special something to a cute summer outift and ambience. Most of the times when new perfumes are being released, there are also bodycare products coming with them - which I never really get around to trying, until now. This shower gel was also gifted to me and it smells divine! Exactly like the their classic fragrance. I don´t use it everyday, as I´d rather safe it for special occassions, haha. It´s texture is not creamy at all but rather an actual gel, which has a very strong scent at first but once you wash it off again it becomes a lot lighter and so lovely! I actually doubt you´ll need to put on perfume after using this product in the shower. 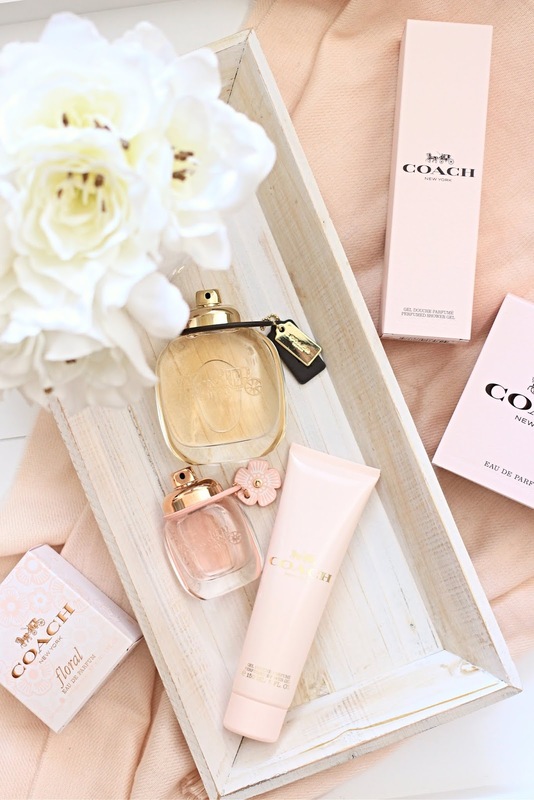 Have you tried the Coach Fragrances before? What kind of perfume do you prefer to wear? Flowery, fruity or something more musky? My brows look already pretty okay without doing anything to them, but I still like to fill the few spare areas in, to perfect and sharpen them. For this I prefer a triangle shaped pencil like this one, over a powder or pomade by far! 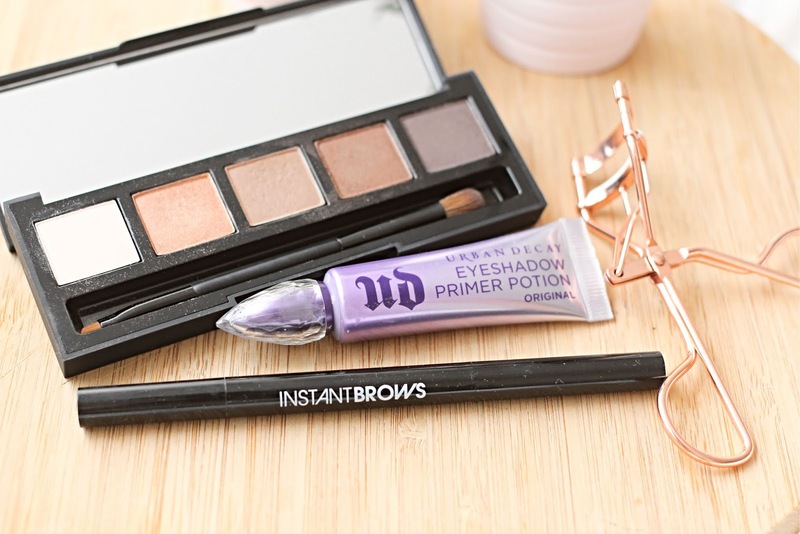 It is just the perfect shade for me, not overly pigmented but buildable - which I find is really important as sometimes I just want a soft brow look and sometimes I like to go full in and make them as sharp as possible - and because of the shape it takes me like a minute to fill my brows in. It´s a product you can take on the go with you, as on one side you get the product and on the other side a spoolie brush - all you need for a quick touch up. Another "issue" that I have to deal with are overly oily lids. It´s impossible for me to wear eyeshadow without any primer underneath, as after a while it´ll just crease away in the ugliest way possible, haha. So to prevent that I´ve been trying through some drugstore eyeprimers which never really did a perfect job. I decided to treat myself to the infamous Primer Potion from Urban Decay. It has been my favourite for a very long time now. It not only keeps my eyemakeup in place but also intensifiies the colours and when worn on it´s own, evens out the colours on my lids - cause I also got quite veiny eyelids haha. What I also absolutely adore about it is, that the applicator is like a concealer applicator, so you can just swipe it all over your lid and blend it in with a beauty blender. Even though I have it since quite a long time now, I still have like half the tube left, so totally worth investing in if you have the same problems with keeping eyeshadow in place. 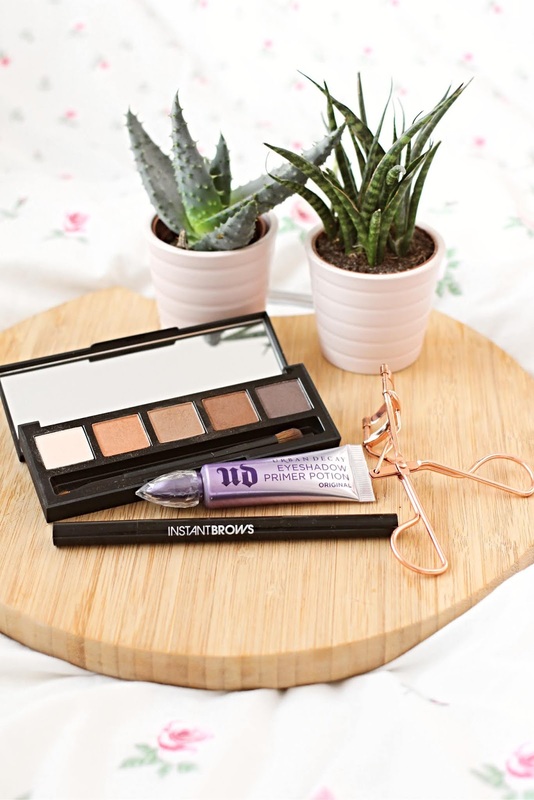 My go-to everyday eyeshadow palette is this one. It´s got exactly the shades I like to wear on my eyes, earthy browns and champagne-y glittery shades. The shades all have just the right amount of pigmentation, even the glittery shades comes off just as it is in the palette. The brush that comes with it is suprisingly also very good - on one side you got a quite stiff blending brush and on the other side you got a kinda liner brush that I like to use with the darkest shade on my lash line instead of actual eyeliner. It´s definitely a palette you can wear all year round, the darker browns shades in the colder months and the rosé gold/champagne colour during the spring to add a hint of colour and sparkle. What are your current favourite eyemakeup products? If there´s anything I absolutely love to treat myself to it´s skincare - even more than makeup sometimes hehe. Simply for the reason that I find makeup can only achieve it´s full effect when you have a (nearly) flawless canvas to work with. For body care it´s nearly the same, but more for my own comfort. Now that the summer is coming closer I want to prepare my skin with enough hydration so that I get a nice and even tan, without having to worry that my skin flakes off immediately after. Treating myself doesn´t mean that I only go for luxurious skincare though. 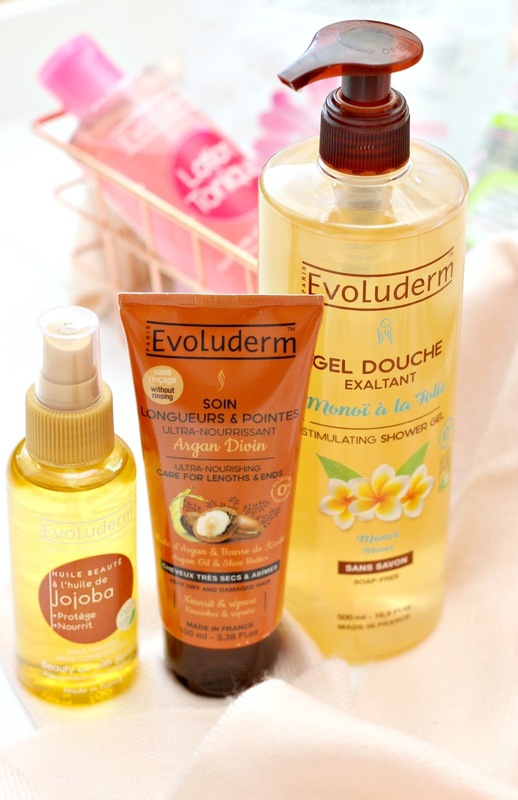 Evoluderm is a french brand that is focused on afforadable cosmetics. Their goal is to give every woman quality skincare with small prices while keeping a sensory aspect. With their huge range of products for face, body and hair, they definitely have something for everybody! You can find all their products in TKMaxx so defintely keep an eye out next time your out shopping! This duo has been soo good for my skin! Since getting this micellar water I´ve been using it to take off my makeup every single day. It takes my makeup off so fast and easy. Compared to the Garnier version this one from Evoluderm is so much better! Literally one swipe with a cotton pad soaked with this and my foundation is gone. I´m literally obsessed with the scent of it! After I took my makeup off, it´s time to take the excess oil and dirt of my skin before I continue with my night cream. 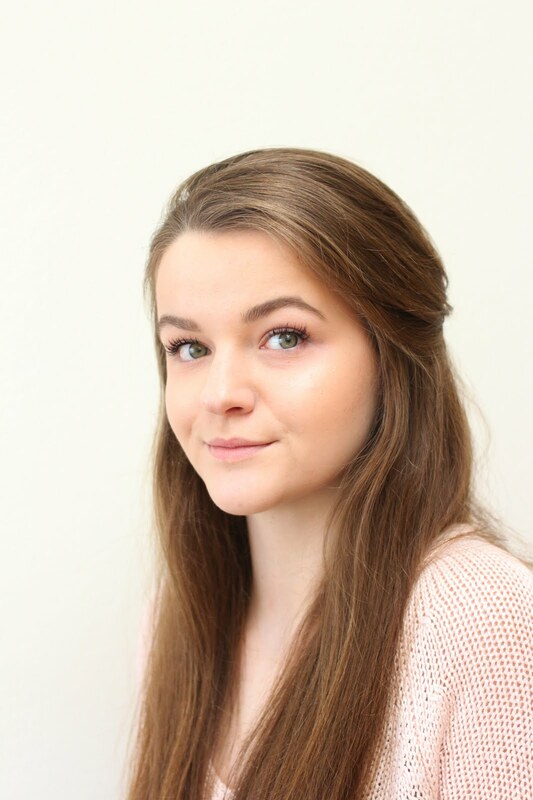 I´m usually not a big fan of toners as I find they are really drying and only cause my skin to get even more blemishes and all in one really bumpy and stingy. This one is just as the micellar water especially made for sensitve skin, and so works very gentle. One of the ingredients are roses, and that´s exactly what the product smells like. After wiping it all over my skin feels squeaky clean, super soft and just really lovely. Both of these products together have helped my skin to clear up and get a lovely glow to it. Who doesn´t love a good sheet mask? I certainly do! They become more and more frequent in the drugstore now, all for different purposes, but honestly most of the times I can´t really feel a difference between them all. This one though was really love - the moment I put it on it felt like a normal sheet mask but after a short time I could feel it soothing my skin. Like you know something is working on your skin when it starts to sting in the places where you got your blemishes and that´s exactly what this mask did. It hydrated my face really well, but what I found was really good that there was just the right amount of product on the mask. After I removed it, there was still a bit of cream left that didn´t sunk in, but I could easily massage it in, without being left with a sticky film on my face. Gel Douche Exaltant in "Monoi" // Shower Gel "Monoi"
I´m not really picky when it comes to shower gel. I just always pick a random one up when I´m out shopping - normally the one that I last saw in a commercial, haha. Well this "behaviour" will definitely stop from now on, as I have found my absolute dream shower gel - and I´m not even overreacting here. This one right here is the only shower gel I´m willing to use for a very long time. The reason for that is first, look at how huge the bottle is, this will certainly last me a good few weeks! Second, it´s soo hydrating and gentle. I always got red itchy patches on my skin, but it has stopped since I´ve been using this product in the shower. And third, it smells like beach holiday in a bottle. Really tropical, like the beach, suncream, heat, everything you relate to a nice summer holiday. It costs around 4€ in TKMaxx which is an amazing price. Please - I beg you - smell it when you get the chance! I swear you will love it. I have thick, wavy, frizzy hair, so I use heat about every third day to atleast try to tame my hair. I´ve been searching for in this tube. It´s hard to see what the actual product looks like from my pictures - sorry for that - but it´s like a white cream. You only need a walnut size of it for the lengths and ends of your hair, which is totally enough. Simply rub it into your hair and it sinks in within seconds, like completely. I´m actually always very sceptical with creams like that as normally they leave a weird greasy feeling and look behind but this is really good. After about half an hour you get the full effect - soft and silky hair. It definitely won´t leave my haircare routine for a very long time - such a good alternative to the Davines Oi Spray aswell. I´m soo unsure about this product. Apparently it´s for dry skin, but it also says you can use it as hydration for dry hair - so that´s exactly where I use it first. I put a rather small amount into my hair, which was a really big mistake haha. My hair looked absolutely horrible, like really greasy and really hard to style aswell. I´ll keep testing and report back as soon as I know how to use it the right way, haha. Congratulations if you´ve lasted until the very end haha. 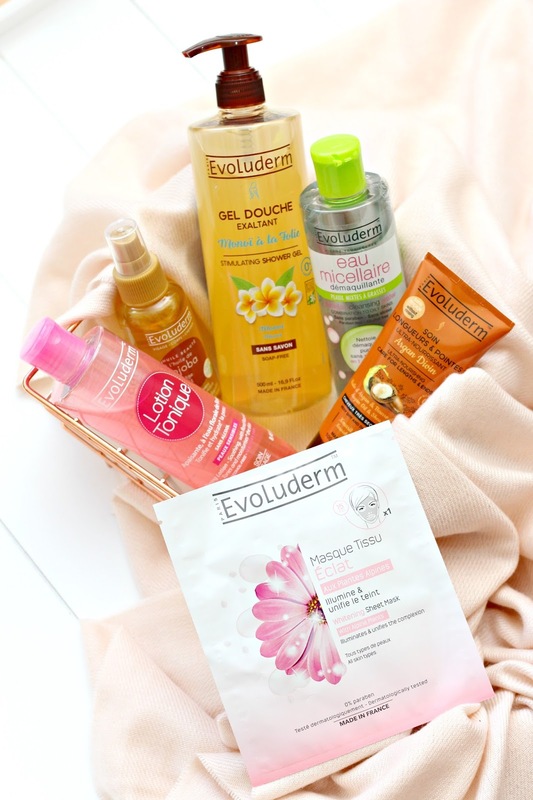 Now we come to the part where you are able to test my favourite products from this pack - together with Evoluderm I´ll do my very first GIVEAWAY - eeeek I´m soo excited. I´ll do it over on my Instagram so definitely keep an eye out for it! Which products I´ll be giving is a little secret so contain your excitement until my giveaway goes live hahaha. 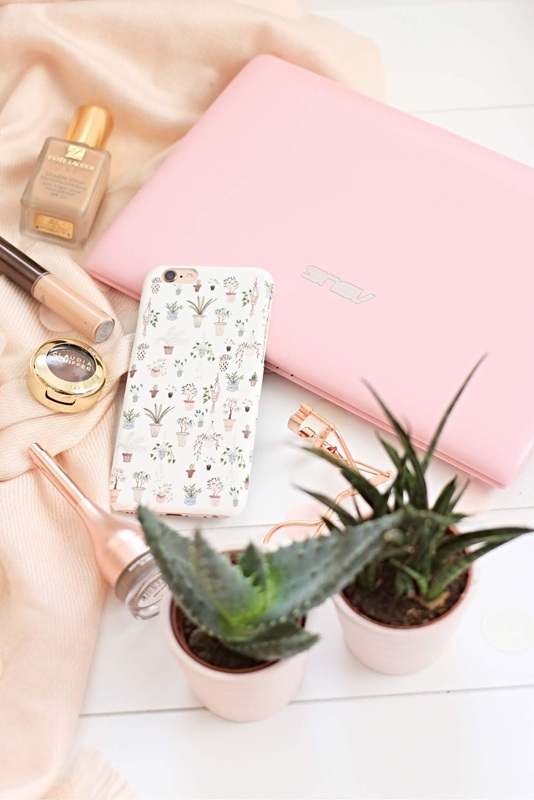 Now that I´ve updated my makeup collection to spring approved products, it´s now also time to update my "accessorizes" - aka my phone. 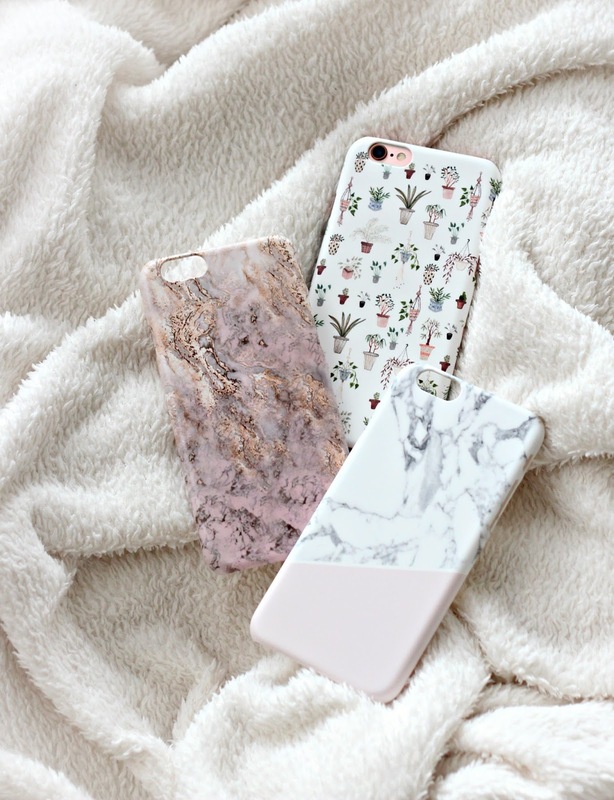 I´m not a girl who wears a lot of accessorizes or jewellery so I kinda have to use my phone or rather the phone cases that I put on my phone to add a little something to my every day looks. I absolutely love buying phone cases, whether it´s really simple ones, seasonal ones - especially christmas phone cases! they can´t be cheesy enough, haha - or creating personal ones for either myself or my friends - it´s just a really cool and thoughtful gift. CaseApp is an online shop that specifies on all things about smartphone, tablets and macbook cases and skins. They offer a huge selection of cases and skins for iPhones, Samsung Galaxy, iPods, iPads and Macbooks, so I´m pretty sure almost all of us will find something fitting for their device - they even offer their designs for iPhone 3 which is very suprising but also very cool, haha. Now to the designs, their offer of different predesigned cases is just amazing and it was soo hard for me to decide on three phone cases. I definitely wanted some that not only look cute but also kinda fit into the colour scheme of my pictures so that I could also use them as blog props. Scrolling through their designs I found varities of marble, flower, fruits, art-y, animals and many other designs. They do not only offer pre designed cases though, you can also design your very own phone cases and skins for your devices - and also even for your phone holder, how exciting is that! Creating them is literally so easy aswell, all you need to do is select your device, upload a picture of your choice - or even more pictures as it´s also possible to create collages - and if you want you can also add a texts, cliparts or a background to the design. Definitely a lot of space to let all your creativity out and create something very special and unique! Now that you´re done with designing, there´s one last step you can decide on, do you want your case to be matte or shiny? Haha. The design gets printed onto the case so it has a really good quality, and I´m pretty sure the print won´t rub off my phone cases really soon - which is something that happens quite often with cheaper options. Especially in the summer months when I get sweaty or oily hands. 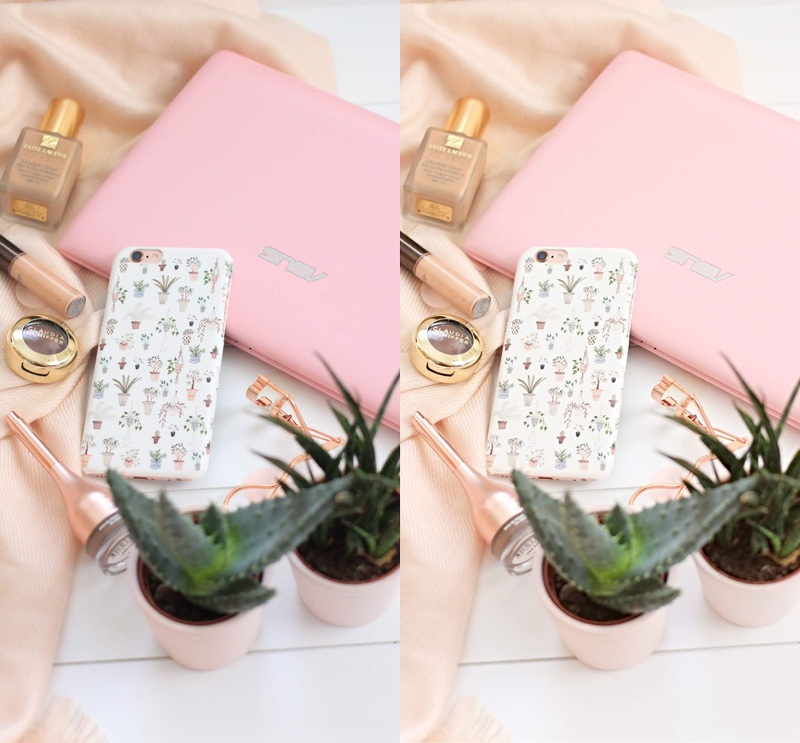 CaseApp offered me to select three phone cases, as I thought not only I should have the chance to give my phone a little makeover, I made my mum and sister select one for each of them aswell. 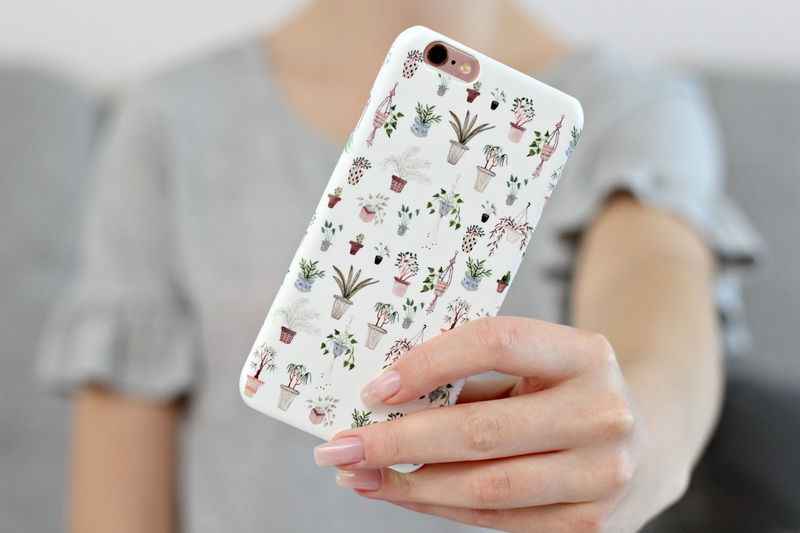 In the end I went for the phone case with little plants on them, I already got a lot of compliments for it and it will definitely appear in loads of future blog posts as it fits just perfectly with my theme! My mum went for the marble design with the pink corner, which I think is really cool, simple and yet has a kinda girly touch to it with the pink detail. My sister went for the gold rosé kinda marble design. Again really cool and so unique, like I´ve never seen a phone case like that! Do you want to get a phone case or skin yourself now?